Wärtsilä has produced a gas-fuelled variety of the popular Wärtsilä 31S engine. The new engine is called the Wärtsilä 31SG. This follows very positive acceptance of the diesel version in marine sector applications. The Wärtsilä 31 has been recognised by Guinness World Records as the world’s most efficient 4-stroke diesel engine. The Wärtsilä 31SG is sharpening the edges of value related to the Smart Power Generation features. The defining feature of the Wärtsilä 31SG is its ability to achieve simple-cycle efficiency levels in excess of 50% (compared to around 40% with modern gas turbines), which represents a milestone achievement in the energy sector. In addition to reducing emissions, this higher efficiency offers the potential for considerable cost savings to power producers. Another huge benefit made possible by the Wärtsilä 31SG is the increased flexibility, which enables rapid response to continuously changing load patterns, especially within systems having a notable share of solar and wind energy. The engine can be continuously operated at 10% load and can reach full load in two minutes from the start command. This flexibility overcomes the challenge created by the daily stops and starts that are inevitable with output from renewable sources. 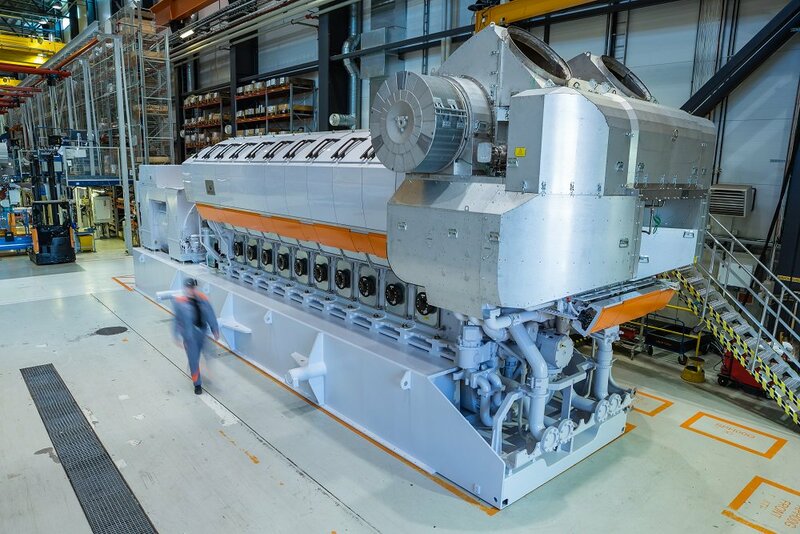 The 20-cylinder, spark-ignited Wärtsilä 31SG produces 12MW of power. The specially designed robust engine structure has an unprecedented brake mean effective pressure (BMEP) of 30 bar, allowing it to fully accommodate all the benefits of two-stage turbocharging. Wärtsilä’s emphasis on efficiency is reflected not only in products such as the Wärtsilä 31SG but also in its lifecycle solution offering. The aim is to ensure that the power plant operates throughout its lifecycle in the most energy-efficient way and in full accordance with regulations. This goes beyond purely maintenance-related activities and involves a holistic approach combining remote operational support and maintenance management services from Wärtsilä’s regional expertise centres, supported by digital innovation and advanced analytics. Based on measured data, Wärtsilä guarantees that performance targets that are agreed upon are met and maintained. In announcing the introduction of the Wärtsilä 31SG, Wärtsilä Energy Solutions Technology and Product Management director Niklas Wägar said: “The Wärtsilä 31SG is now available and represents a new-generation answer to the rapidly evolving need for greater flexibility and better efficiency in power generation. “It is the world’s most efficient 4-stroke combustion engine and it raises the bar in so many areas, including reliability and serviceability.